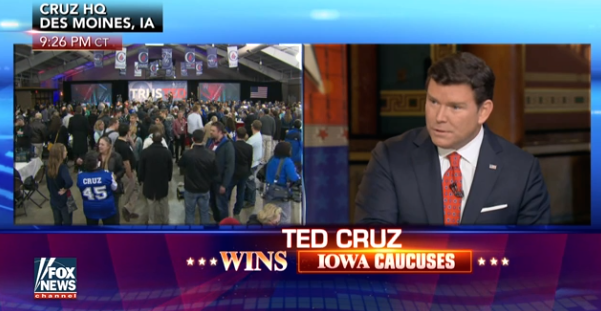 The Iowa caucuses, which took place on Monday night, set new viewership records for all three cable news networks, according to Nielsen fast data. Fox News led the way with 4.46 million total viewers between 8 and 11 p.m., followed by CNN with 3.73 million viewers and MSNBC with 1.97 million viewers. In the advertiser favored demo, CNN took the top slot with 1.39 million viewers, followed closely by Fox with 1.17 million viewers and MSNBC, which limped in with 592,000 viewers. The increased viewership can be attributed to the massive interest in Donald Trump, who unexpectedly finished second to Ted Cruz after leading in the polls, and the tight race between Hillary Clinton and Bernie Sanders. Clinton eked out a slim victory, though not without some controversy. Compared to 2008, the last time there was an open primary in both parties, Fox News was up 80 percent in total viewers and 45 percent in the demo; CNN was up 69 percent in viewers and up 56 percent in the demo; and MSNBC was up 50 percent in viewers and up 1 percent in the demo. The caucus did see two candidates leave the race: Martin O’Malley for the Democrats and Mike Huckabee for the Republicans, with more likely to follow after next week’s New Hampshire primary.